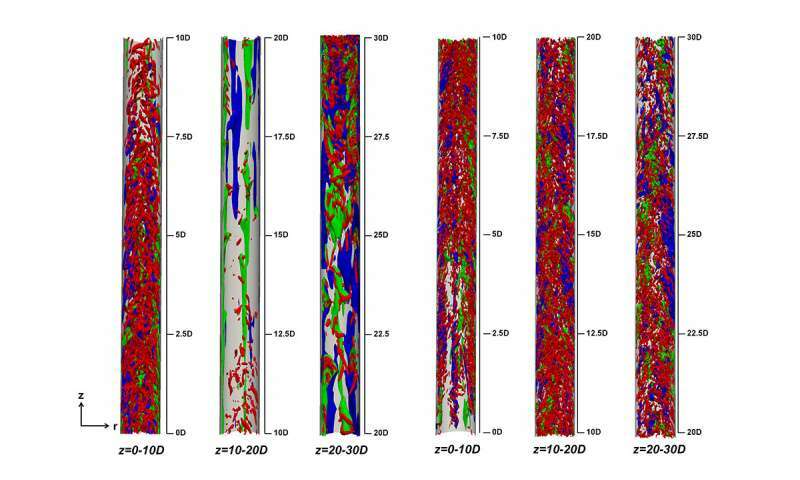 High-performance computing resources and data-driven machine learning help University of Stuttgart researchers model how coal, nuclear and geothermal power plants could be retrofitted for cleaner, safer, and more efficient and flexible operation. In conventional steam power plants, residual water must be separated from power-generating steam. This process limits efficiency, and in early generation power plants, could be volatile, leading to explosions. In the 1920s, Mark Benson realized that the risk could be reduced and power plants could be more efficient if water and steam could cohabitate. This cohabitation could be achieved by bringing water to a supercritical state, or when a fluid exists as both a liquid and gas at the same time. While the costs associated with generating the temperature and pressure conditions necessary to achieve supercriticality inhibited wide adoption of Benson's patented Benson Boiler at power plants, his concepts offered the world its first glimpse at supercritical power generation. Almost a century later, researchers at the University of Stuttgart's Institute of Nuclear Technology and Energy Systems (IKE) and Institute of Aerospace Thermodynamics (ITLR) are revisiting Benson's concepts to explore how it can improve safety and efficiency in modern power plants. Using high-performance computing (HPC), the researchers are developing tools that can make supercritical heat transfer more viable. "Compared with subcritical power plants, supercritical power plants result in higher thermal efficiency, elimination of several types of equipment, such as any sort of steam dryer, and a more compact layout," said team member Sandeep Pandey, a Ph.D. candidate at IKE. While power generation and other industrial procedures use a variety of materials to generate steam or transfer heat, using water is a tried and true method—water is easily accessible, well-understood on a chemical level, and predictable under a wide range of temperature and pressure conditions. That said, water predictably enters its critical point at 374 degrees Celsius, making supercritical steam generation a sizzling process. Water also needs to be under high pressure—22.4 megapascals, or more than 200 times the pressure coming out of a kitchen sink, in fact. Further, when a material enters its critical state, it exhibits unique properties, and even slight changes to temperature or pressure can have a large impact. For instance, supercritical water does not transfer heat as efficiently as it does in a purely liquid state, and the extreme heat needed to reach supercritical levels can lead to degradation of piping, and, in turn, potentially catastrophic accidents. "sCO2 actually has zero ozone depletion potential, and little global warming potential or impact when compared to other common working fluids, such as chlorofluorocarbon-based refrigerants, ammonia, and others," Pandey said. In addition, sCO2 needs far less space and can be compressed with far less effort than subcritical water. This, in turn, means that it requires a smaller power plant—an sCO2 plant requires ten-fold less hardware for its power cycle than traditional subcritical power cycles. In order to replace water with carbon dioxide, though, engineers need to thoroughly understand its properties on a fundamental level, including how the fluid's turbulence—or uneven, unsteady flow—transfers heat, and in turn, interacts with machinery. May carbon dioxide turbine help address clean power generation? Can we generate clean energy by using sunlight to superheat fluids?